Rogelio B. Gonzales of Poteet passed away Wednesday, March 27, 2019 at the age of 84. He was born in Dilley on September 6, 1934 to Willie M. and Eulogia (Benavides) Gonzales. Rogelio enjoyed barbecuing, cooking and going to the Kickapoo Casino. Most of all, he enjoyed spending time with his family. Rogelio is preceded in death by his wife, Gloria Gonzales; parents, Willie and Eulogia Gonzales; grandson, Daniel Garza; sister, Paula Torres and nephews, Richard Rodriguez, Gilbert Torres, Javier Torres and Eric Gonzales. Rogelio is survived by his sons, William Gonzales and wife Rosalinda, Raymond Gonzales and Marcel Ferrari and wife Marty; daughter, Sarah Mendoza and husband Jose; brothers, Willie Gonzales, Inez Gonzales and Mauro Gonzales and wife Norma and sisters, Ester Rodriguez, Elia Cavazos and Norma Valle. 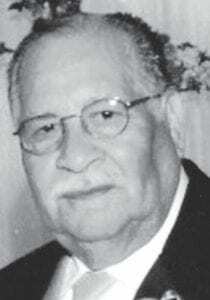 He is also survived by his grandchildren, Roger Gonzales, III and wife Alma, Michael Gonzales, Cheyenne Gonzales, Gabriel Gonzales, Augustine Mendoza, Addysun Mendoza, Gloria Mendoza, Krystal Morales, Samantha Vasquez, Miranda Ferrari, D’ago Ferrari, Hillary Garza and Selena Garza and greatgrandchildren, Cristobal Gonzales, Alejandra Gonzales, Gloria Gonzales, Tristen Gonzales and Alexa Gonzales. Visitation was conducted at Hurley Funeral Home in Pleasanton on Monday, April 1 from 2-9 p.m. with a rosary recited at 7 p.m. Funeral mass was celebrated at St. Philip Benizi Catholic Church in Poteet on Tuesday, April 2 at 10 a.m. Interment followed at Madre Dolorosa #2.